An inspirational, upbeat collection of relatable lessons from the teen sensation, Mackenzie Ziegler—an award-winning dancer, singer/songwriter, and actress. Growing up is hard, but growing up in the spotlight is even harder. However, Mackenzie Ziegler is taking it all in stride, thanks to her positive attitude on life. From getting her start on Dance Moms, to her sold-out tour alongside Johnny Orlando, there’s nothing that she can’t do. 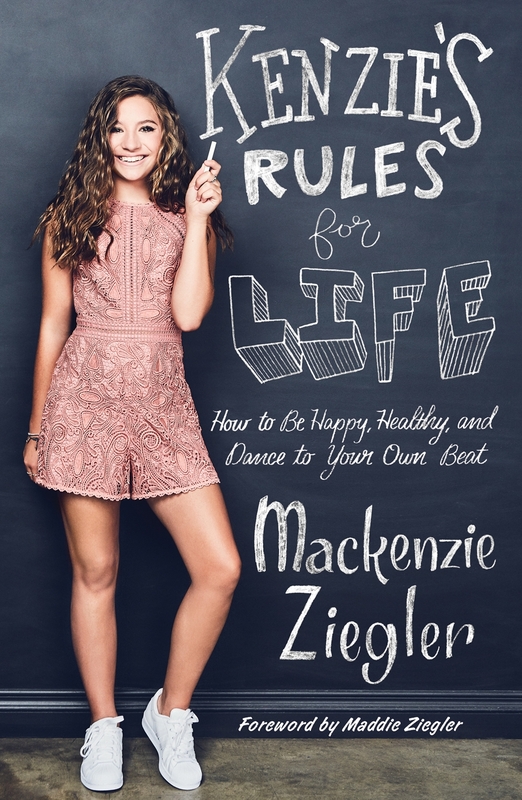 In Kenzie’s Rules for Life, the dance prodigy, singer/songwriter, actress, and model offers her advice on friendship, family, fitness, style, and positivity. She shares lessons drawn from her own experiences for those navigating through their tween years on how to be happy, healthy, and confident in all aspects of their lives. So, I’ve always been a “go with the flow” kind of girl—when life hands you lemons, you make lemon slime (see recipe page xvii). My mom will tell you I have a “sunny, upbeat personality,” and my sister Maddie will agree and insist that nothing ever bugs me. But that’s not true—stuff does bug me. Stuff drives me crazy. (Um, Maddie drives me crazy sometimes, especially when she steals my makeup.) But I’ve always believed that life is what you make of it. You can sit around and mope and complain and feel sorry for yourself, or you can find a way to make things work and have a really great time doing it. » Friends are the people who really know you and like you—even when your feet smell. » Haters gonna hate. They have nothing better to do with their time. I do! » If you see it, you can be it: There’s no such thing as dreaming too big. My dreams are XXL. » If I’m taller than my mom, I should be allowed to ride in the front seat of the car. Just sayin’. A lot of people ask me questions through social media or when they bump into me shopping at the Grove in L.A.—about everything from how to handle embarrassing situations and tips on beauty and style, to boy problems and how to convince your parents to let you stay up late on a weekend (still working on that one!). So I thought I should probably organize my answers and put them all down in one place. A book sounded like a really great idea—a lot of work, but a really great idea! I mean, I would have loved to have had some of these answers handy when I was younger and dealing with all the tween drama. People don’t know how tough it is to be a kid these days unless they’re a kid themselves. But I get it. I get all the pressure, not just in front of your face at school or at the dance studio, but on social media, too. Growing up and trying to find your way in this world can be tough—I’m still figuring it out myself. And I’m really flattered when someone comes up to me and wants my advice. I’m glad you guys trust me, because I always try to be honest. Sometimes I might say something silly or put my foot in my mouth (I can actually do that, you know—I’m pretty flexible! ), but when someone asks me what I think, I tell them. I remember sitting for interviews with Maddie when we were on Dance Moms and she would roll her eyes when I gave my real opinion on something (“Kenzie, you can’t say that!”). Well, I just did! I never hold back. I’m never going to be someone I’m not, or act a certain way to fit someone else’s idea of who I should be. That’s just a formula for being unhappy and unsuccessful, don’t you think? It’s like being a fake or a phony, or putting on a mask. And I don’t mean one of those soothing sheet masks you get at Sephora—I mean one that hides who you truly are. You want to be the best person you can be? Then be yourself! Sounds like a good rule to me! Never let a potential mess stand in your way—another one of my rules. Whether it’s a literal mess (like the time I decided to tie-dye my sneakers and wound up tie-dying myself instead) or something that doesn’t involve staining the rug, you should do it. What have you got to lose? So you try something you’ve never done before and it’s an epic fail. So what? If I make a fool of myself, I laugh about it. And I don’t give up easily. I try it again, and I work harder till I figure it out. Persistence is a great rule for life: You can never go wrong with never giving up. So you can see how these rules of mine come about. It’s a lot of trial and error and doing what makes me feel good, not just about a situation, but about who I am as a person. I hope you read them, try them out if they sound fun and helpful, and then eventually make your own rule book for life, because that’s really the goal of growing up. You get to decide what and who you want to be and how you want to go about it. For now, since I’m only a teenager, I guess I have to listen to most of what my mom and stepdad tell me to do (although the rule about making your bed every morning doesn’t seem like a keeper). To be honest, my friends and family have always been really supportive and cool about letting me be me. My mom will tell you she’s my biggest fan, and I know it, because I couldn’t have done any of the things I’ve done so far without her cheering me on. She was the first person who noticed me singing around the house all the time and suggested I take voice lessons. Now, I’m recording and writing my own music and playing to huge concert audiences all over the world! Who knew? But it goes to show that you need people who are willing to stand behind you and believe in you. As you read this book, think of me as that person for you. I know you can do whatever you set your mind to. I also know that sometimes things feel confusing and overwhelming and super frustrating, and you’d probably rather just pull the covers over your head and not come out for a week. That’s when you take a deep breath and go make that lemon slime. Did I mention you can eat it, too? Mackenzie Ziegler, born in Pittsburgh, Pennsylvania, quickly became one of her generation’s most influential rising stars. The professional dancer, singer/songwriter, and actress starred on Lifetime’s hit reality TV series Dance Moms for six seasons. Taking her talents to new levels, her debut album soared to #1 on the iTunes Pop Charts. Mackenzie expanded her creative crafts by partnering with powerhouse brand Justice clothing, and brought her own flair to the Mackenzie Ziegler for Justice Active collection. Find out more on MackenzieZieglerMusic.com.